A View of the Lake - West Kelowna Bed and Breakfast in the beautiful Okanagan Valley of British Columbia. Enjoy our luxurious modern and contemporary home with designer ensuite guest rooms. All guests have access to a private lounge, patio and separate entrance. Please refer to our Policies page for details regarding our B & B for such information as arrival times, cancellations, refunds, etc. 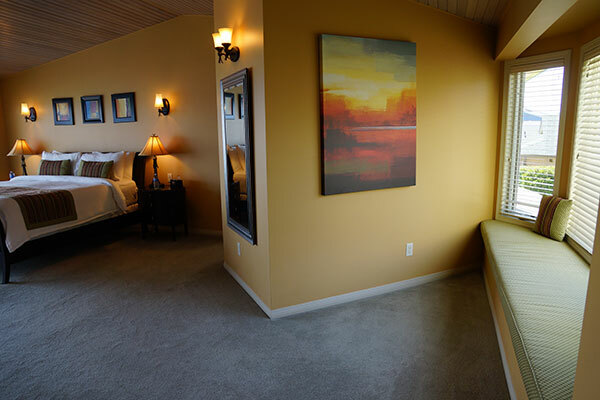 All our guest suites have whisper quiet air-conditioning with individual thermostats for your personal comfort. 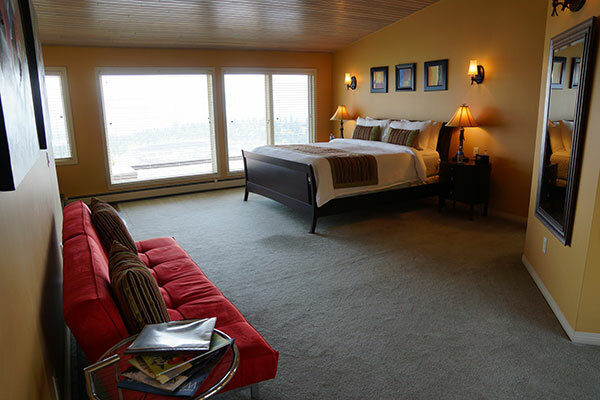 Three of our four suites have fabulous sweeping views of Okanagan Lake, the City of Kelowna and the Monashee Mountains, and our fourth suite, Garden View, has an enachanting view of the front Garden. All guest rooms feature quality linens, towels and security safes. Private ensuites have hair dryers, toiletries and soft robes. Free highspeed wireless Internet is available throughout. There is ample free off-street parking for all of our guests. Please note that 5% GST and 8% PST taxes are applicable to all stated room rates. Once you have decided on one of our guest suites, please click on the "book now" image and you will be redirected to our secure online booking software. *Note: by booking directly through our website instead of through any third party travel websites to which we subscribe, you get the lowest possible pricing! So book directly from this page and start saving! 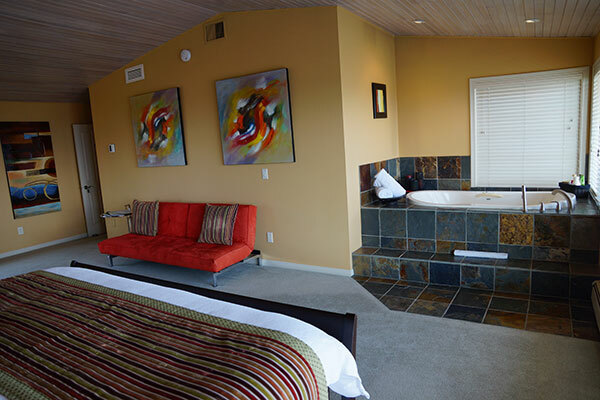 Enjoy this spacious contemporary deluxe King suite, with panoramic views of the mountains, Okanagan Lake and the City of Kelowna. Low season: $160 for one night; $150 per night for two or more nights. High season: $195 for one night; $185 per night for two or more nights. Our Lake View suite is a Queen room and has an inviting panoramic view of the mountains, Okanagan Lake and the city of Kelowna. Wake up in the morning and watch the sunrise from your bed. Low season: $140 for one night; $130 per night for two or more nights. High season: $165 for one night; $155 per night for two or more nights. 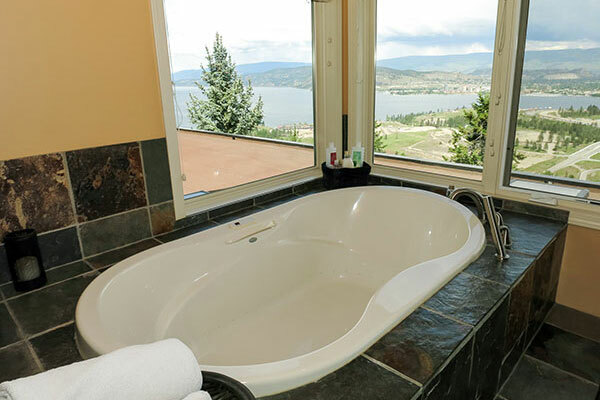 Our Valley View suite has a side view of the valley, Okanagan Lake and the mountains. This room features a King size bed. 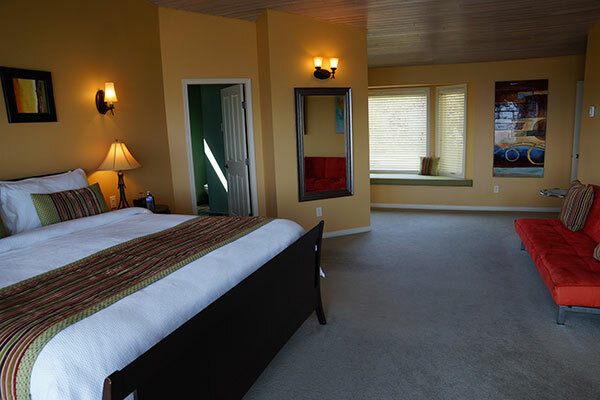 Our Garden View Suite has a King size bed, which can be made into extra long twin beds. The views are of the front garden with West Kelowna's Mount Boucherie in the distance. Please note that there is a one-time surcharge of $10 for the twin bed option. Low season: $130 for one night; $120 per night for two or more nights. High season: $150 for one night; $145 per night for two or more nights. A View of the Lake Bed & Breakfast , 1877 Horizon Drive,	West Kelowna, British Columbia V1Z 3E4, Canada. Copyright 2019 A View of the Lake Bed & Breakfast, West Kelowna, British Columbia, Canada.